Last Tuesday, I wrapped up what was a marathon session of public speaking engagements around Nova Scotia to try and explain to anyone who would listen why we should all be concerned about the Glaze report. From Antigonish to Mahone Bay, the people I spoke to shared surprisingly common views on how Glaze is being rolled out. School Advisory members spoke of not wanting the responsibilities they are being asked to take on. Parents spoke of not wanting to lose their local school’s principal. Elected school board members spoke of loss of rural and minority voice in education. It would seem that, based on the latest news coming out of the legislature via Zach Churchill, I was not the only one hearing concerns. All around, from hither to yon, the response was markedly negative. To be fair, I would say that was to be expected. Many folks knew my take on Glaze, so in many rooms, I was rather preaching to the converted, if you will. That, however, did not do anything to lessen the impact on me of their shared perspective. I was expecting everyone to be concerned, for sure, but I was moved by how similar those concerns were. Interestingly enough, however, that wasn’t the most surprising thing for me. Although these similarities were certainly re-affirming, it was in the casual conversations and follow up e-mails where I found some of the most impressive commonalities. These were concerned, engaged citizens, some of the most engaged we have in the Province in fact. And in every room, in every community, I was struck by how even many of these engaged citizens were unaware of how good a job our system actually does of educating our young people. The thing of it is, this is just not true, and all across the province, even the partisan public I was speaking to were surprised by this. Consider the following graph that Avis Glaze uses in her report. 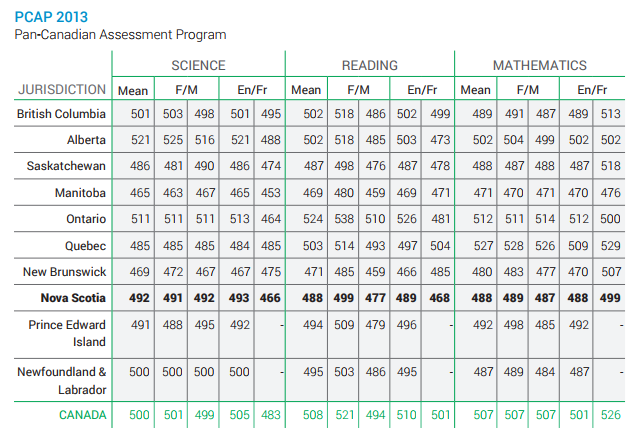 This is a chart showing how well students did in the 2103 Pan- Canadian Assessment Program (PCAP), a test put out every three years through the Council of Ministers of Education in Canada. 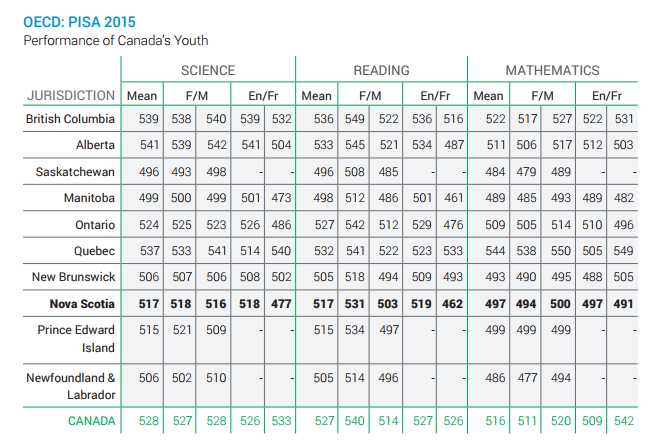 Now, if you look at Nova Scotia’s score of, say, 492 in Science, that is below the Canadian average of 500. But the difference is less than 2%. If you look at a subject like Math, the difference between Nova Scotia students and the Canadian average is only about 4%. Perhaps more telling is the difference between Nova Scotia and Canada’s top performers. We were 6% behind BC in Science, 7% behind Ontario in Reading, and about 7% behind Quebec in math. No one province had top scores in any two subjects in 2013, and, in fact, if you look at the difference between the subjects, Nova Scotia had one of the smallest inter subject gaps in the country. If we increased our scores by 5%, we would be 2nd in the country in all 3 subjects, with only a single, different province ahead of us in each. The results from the Programme for International Student Assessment (PISA) from 2015, also cited in Glaze, tell a similar story. Although much ado has been made about our math scores, in 2015, we were, again, only behind the national average by about 4%. The same was true of our reading scores, and we were only about 2% behind the national average in Science. Again, no single jurisdiction in the country led in more than one area, and if you consider the top performers in the nation, no one outperformed us by more than 9%. A similar jump of 5% would put us first in Science, first in reading, and tied for 2nd in math. Finally, if you look at our international standing, there is even more good news. 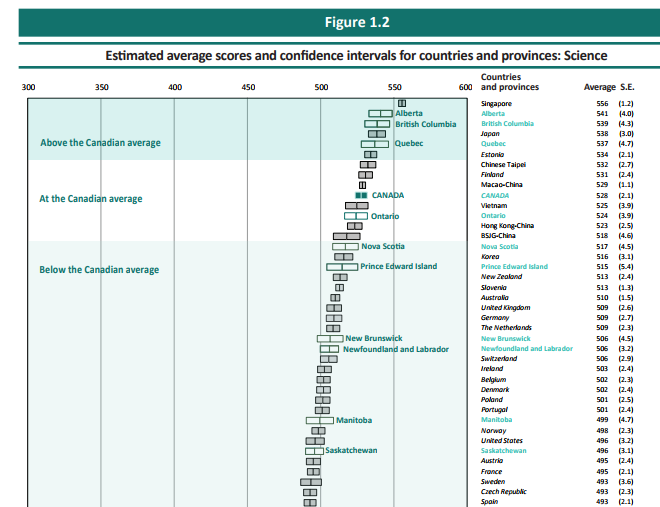 If Nova Scotia were a country, we would be among the top 15 best performers in teaching Science on the planet. What came as a tremendous shock to my primarily partisan audiences as I spoke to was how few of them were aware of these facts. And I use the word “fact” very specifically here. I am no fan of standardized tests to be sure, but if I am going to get beaten with test scores, then I reserve the right to defend myself. These numbers do not lie. When it comes to teaching our kids, Nova Scotia’s system is not only among the best in the country, but among the best in the world. It is hard for me to wrap my head around why this government has displayed an appetite for implementing such radical changes as abolishing local school boards in the face of such evidence, particularly when they chose the evidence in the first place. Look, I am not anti-change. But, if this government wants to convince me that the Glaze report and its accompanying recommendations has anything to do with student achievement, they are going to have to do better than this. And, to echo many of the several hundred people I have spoken to in the last two weeks, if all this is not about student achievement, then what, pray tell, is it about? As Nova Scotians, it may be time to face a very uncomfortable truth about what may actually be motivating educational reform in our province. Originally published in revised form in The Chronicle Herald, March 1st, 2018. On the other hand, there are parents such as me that fully support the report and the changes the gov’t is bringing in. Hi Marcus, thanks for reading. I wonder of you would be interested in sharing why you are supporting these changes?